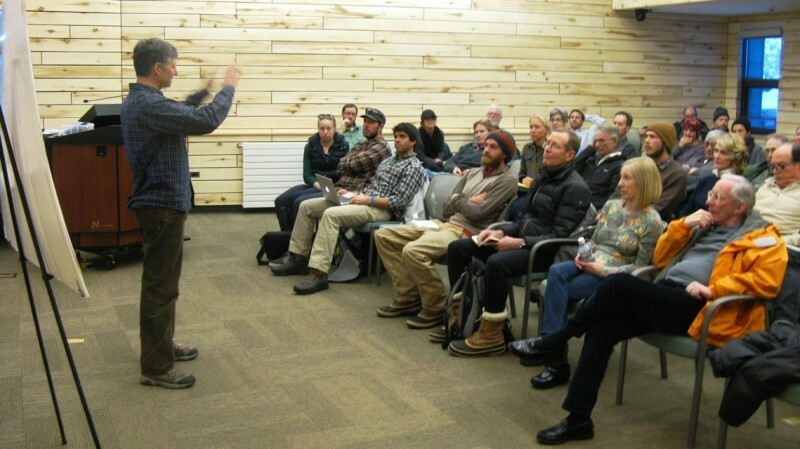 Gary Tennenbaum, assistant director for Pitkin County Open Space and Trails, at an organizational meeting at Basalt Library on Feb. 3. 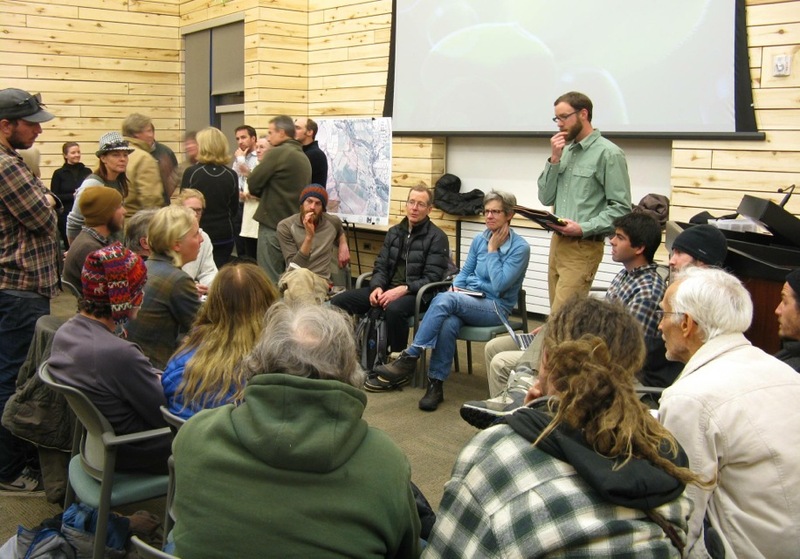 BASALT – Thirty hands shot up when Gary Tennenbaum asked for volunteers to spend upwards of 100 hours forming the comprehensive management plan for two open-space ranch properties in the middle of the Roaring Fork Valley. Tennenbaum, assistant director for Pitkin County Open Space and Trails, made it clear at an organizational meeting at Basalt Library on Feb. 3 that the management plan will be a long-term work in progress. The steering committee includes: Ted Guy, David Brown and Alec Parker, representing wildlife/conservation interests; Brian or Michael Davies, Michael Carricarte, Laura Smith, Anne Clapper and Temple Glassier, representing the neighborhood; Rory Cerise, Michael Thompson, Jason Smith, Cory Britten and Jerome Osentowski representing agricultural interests; and Holly McLain, Mike Pritchard, Dave Koenck, Tom Trowbridge, Dan Hamalak and George Trantow, representing recreational interests. In addition to recreational, agricultural and wildlife concerns, the committee’s work will result in a management plan that addresses parking, access and other issues. The group, which will be joined by officials from Pitkin County Open Space and Trails, Eagle County Open Space, the town of Basalt, Colorado Parks and Wildlife and the Bureau of Land Management, is expected to meet monthly for the next five to six months. Tennenbaum was confident that the large turnout indicates heightened interest in public stewardship of public lands, especially lands with potential to produce locally grown food by local farmers. Breakout sessions following Tennenbaum’s introduction divided the group into areas of interest. The agricultural group was nearly double the size of the recreation group, made up of farming experts like Jerome Osentowski, founder and head of Central Rocky Mountain Permaculture Institute, and Michael Thompson, a Basalt architect who specializes in greenhouse designs for growing local food. The Fred L. and Freda L. Glassier Ranch and Red Ridge Ranch (formerly Saltonstall Ranch), two adjacent open space parcels off Hooks Spur Road in the Emma area, together encompass about 282 acres reaching from the Roaring Fork River up to roughly 8,000 feet on the slopes of the Crown. The parcels contain about 140 irrigated acres, and the Glassier property includes an historic Victorian home and associated outbuildings. Its purchase earlier this year came with significant water rights in the Home Supply Ditch and about 500 feet of Roaring Fork River frontage. The Rio Grande Trail accesses both properties. Both parcels, located in Eagle County, are extensions of the land originally homesteaded by Fredrick H. Glassier in the late 1800s. The open space is adjacent to the 70-acre Emma Farms conservation easement, held by Aspen Valley Land Trust. Glassier and Red Ridge, now being planned as a single open space, are currently closed to the public pending the completion and adoption of the management plan. Editor’s note: Aspen Journalism is an independent nonprofit news organization and collaborated on this story with The Aspen Times, which published a version of the story on Monday, Feb. 10, 2014.